Derby's waste - a rubbish blog ! : Burn baby burn ! One of the biggest myths in waste management is that the new Advanced Thermal Treatment (ATT) plants are not incineration plants! Time and again when these new plants are wheeled out by councils and developers we are told they are clean, green AND NOT INCINERATION ! Developers put forward exotic names for the processes they are trying to peddle like GASIFICATION or PYROLYSIS and they claim their processes do not burn wastes but heat them producing syngas which is then used for power generation. While standard mass burn incineration burns waste in an oxygen rich environment developers peddling their alternatives often use controlled levels of air / oxygen and in some cases no oxygen in what they consider to be a more controlled process. These processes are now being pushed across the UK and in recent years a number of proposals have been put forward for Derby and Derbyshire. Councils and developers when attempting to gain planning permission favour using terms such as gasification and pyrolysis because by doing so it keeps the word incineration out of the public eye because when rumbled councils and developers come up against stiff opposition. 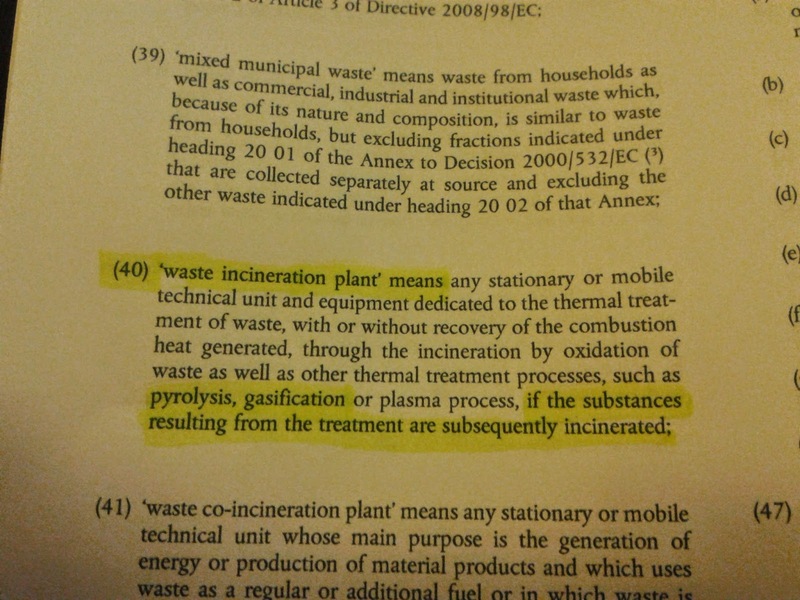 Such processes are claimed to be clean and green and at times even those who object to waste incineration plants are fooling into thinking such plants are a better alternative to mass burn incineration and this extends to government who now offer subsidies for electricity produced by Advanced Thermal Treatment plants. The elephant in the room is that mass burn, gasification and pyrolysis are ALL incineration plants because no matter if its a throw it in and burn it plant or a plant that produces syngas via controlled processes when the gas is burnt its an incineration plant. We know this because Europe have defined what constitutes an incineration plant in the waste incineration directive - often known as WID. This set of regulations sets out the description of such plants, their control and the expected emissions standard for the plant. So while up and down the country the same argument can be heard at waste gasification plant public consultations about the proposals not being incineration councils and developers cannot escape facts ! and the facts are EUROPE SAYS THESE PLANTS ARE INCINERATION PLANTS! So that is what they are!